Lovely house built in the 1950's and fully renovated. 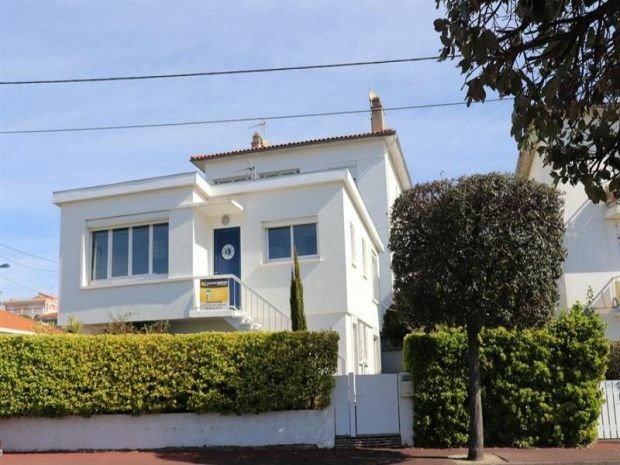 Situated facing the tennis courts and Thalossotherapy centre close to Le Chay beach in Royan. (250m from the beach). The main living area is on the first floor to fully appreciate the wonderful sea view. Accommodation includes: Entrance hall. Large living room with flat-screen TV. Open plan kitchen with fridge freezer, dishwasher, washing machine, microwave and Nespresso machine. Parental suite with large double bed of 160 and ensuite shower room and WC. Downstairs: Hallway leading to the terrace. Two double bedrooms with beds of 140; Twin room with beds of 90, All bedrooms on this level open out to the east of the property. Shower room and WC. Table tennis, private terrace, garden furniture and bbq. Internet access. SLEEPS 8. The Chay is a residential area of the city of Royan. Located in the western part of the town, it is adjacent to the districts of Foncillon and Pontaillac. It shelters two small "conches", or beaches: that of Chay and that of Pigeonnier. For the more athletic, there will be the Garden Tennis facing the house, place which, without a doubt is one of the most beautiful clay sites in France thanks to an exceptional location, overlooking the sea and the estuary; or a sports course that is set up along the coast, with a dozen apparatuses (weight machines, rowers, etc.) available for self-service, or access to the cycle route EuroVelo 1 ("Vélodyssée") ") Is located nearby. For others, the thalassotherapy center located on the cliff will be nearby and finally, a walking path is built. Many activities await you!